INJURY UPDATE/VIDEO INTERVIEWS: Story also includes updates on the injury status of Matt Greene and Trevor Lewis, along with video interviews with Greene, Lewis, Martin Jones, Ben Scrivens, Darryl Sutter, and a fascinating, don’t miss interview with goaltending coach Bill Ranford. 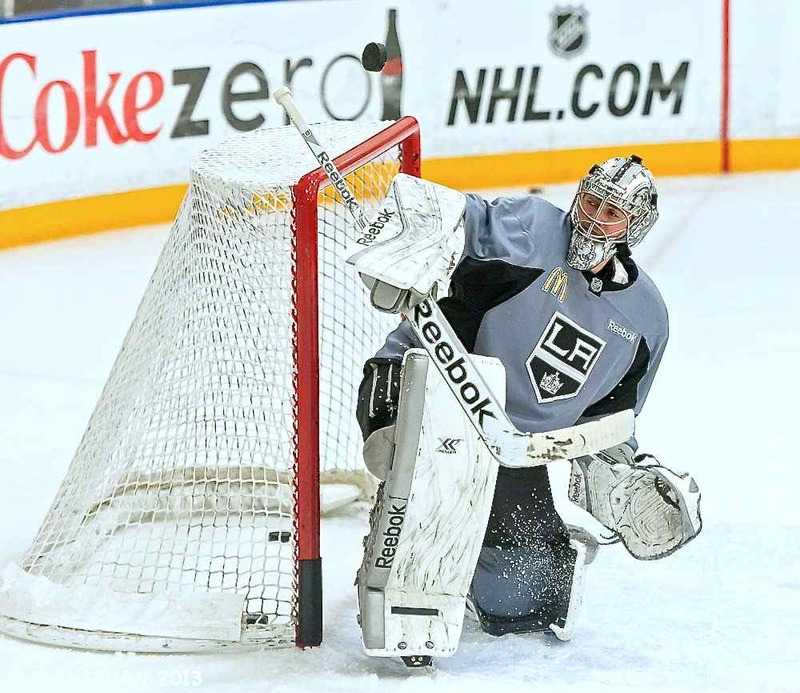 LOS ANGELES AND EL SEGUNDO, CA — Goalie Gate, as one member of the local media has dubbed it, took a another twist after the Los Angeles Kings wrapped up their practice on December 8. To review, goaltender Ben Scrivens led the team onto the ice for warm-ups, and because tradition dictates that the starting goaltender lead the team onto the ice, that “confirmed” that he would start against the New York Islanders at Staples Center on December 7. But rookie Martin Jones got the call instead, starting his second consecutive game—the first two games of his National Hockey League career—earning a 3-0 shutout victory. The move left reporters scratching their heads, wondering if they had been duped by head coach Darryl Sutter. What caused the change? After two days, no one knows for sure, except for Sutter. “It was supposed to be the other guy’s start,” Sutter added. Going back to the morning skate prior to the game, Jones left the ice first when practice was over. At least for the Kings, the starting goaltender for that evening’s game has been the first one to leave the ice after the game-day skate—this has served as a sure-fire confirmation for many years. But there is an interesting twist, this time, as Scrivens left the ice right on the heels of Jones, and even though he was the second goalie to leave the ice, members of the local media shrugged that off, making the logical assumption that since Jones played the night before, Scrivens would get the start against the Islanders. Naturally, the intrigue caused by the unexpected change pushed this story to the forefront during the post-game press conference with Sutter, who was critical of the media. At that point, Sutter, the head coach, turned into Sutter, the journalist, and he immediately began interviewing himself. Sutter got some laughs from the media for that move, but chances are, the joke was on those who were laughing. Jones indicated that he knew before the game that he would get the start that night. He later clarified that statement, saying that he found out in the afternoon, well after the morning skate had ended, which seems to indicate that he did not expect to get the start against the Islanders. 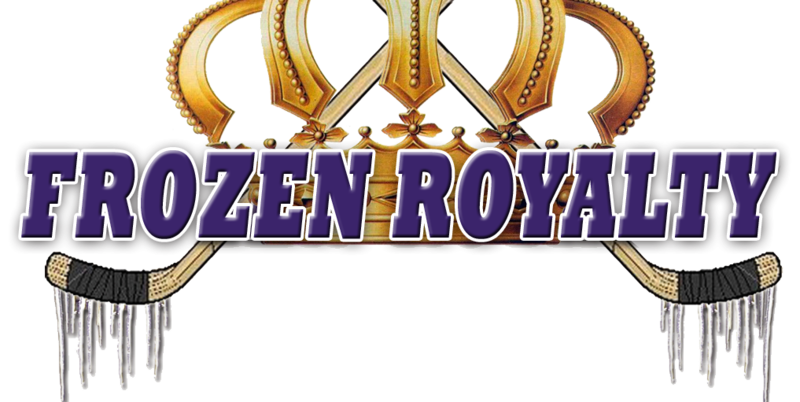 Sutter indicated that Scrivens was nursing some sort of minor injury. “Scrivens was a little dinged up and he didn’t feel right in warm-up,” Sutter explained after practice on December 8. But Scrivens participated in Sunday’s practice, looking no worse for wear. On top of that, he was not wearing any additional protective gear, no taped fingers, no braces, splints, scars, sutures, or anything else. He was not drinking extra fluids. In fact, he showed no apparent signs of injury or illness. Scrivens was then asked if he had been told by Sutter that he would be the starting goaltender. Scrivens would not elaborate on what “stuff” happened. Although we will probably never know if Sutter was pulling a fast one on the local media or not, the fact remains that he is highly protective of anything that could reveal information, such as the nature of injuries, when an injured player might return to action, and yes, even who the starting goaltender will be for a particular game. “This isn’t baseball,” Sutter once said, responding to a reporter asking who his starting netminder would be for a game during the 2011-12 season. He elaborated, stating that unlike in baseball, where teams must announce in advance who their starting pitchers will be, hockey teams are not obliged to announce their starter in goal. Given how highly protective he is about information getting out, it would not surprise me if all this was a calculated ruse, courtesy of Sutter, even though we will probably never know for sure. But even if this was simply the way things fell into place that day, Sutter gets what he wants, either way. After all, although the local media will continue to note who the first goalie to leave the ice was after a morning skate, that is no longer anywhere near as reliable an indicator as it was just a handful of days ago. Indeed, for the local media who participate in the “LA Kings Goalie Tweet-Off” on Twitter after game-day skates, chances are high that they will start using the word, “expected” from this point forward. Defenseman Matt Greene and forward Trevor Lewis both remain on injured reserve, but they have been skating with the team in practice lately, and both will travel with the team on their four-game road trip that will take them to Montreal and Toronto (December 10 and 11), and Ottawa and Chicago (December 14 and 15). But the way the players were talking, it seems that Lewis might be closer to returning than Greene. Pushing things back in the direction of Sutter’s comment is that fact that the Kings assigned defenseman Jeff Schultz back to the Manchester Monarchs of the American Hockey League on December 8, a move that was likely made to clear a roster spot in anticipation of Greene’s return.